I am officially over superfoods. I have been for quite a while now. They are over-promoted, over-priced and over-done. Take quinoa for example. Sure, it’s a nutritious grain. Actually it is not really a grain, the part we eat is the edible seed of the quinoa grain crop, although the nutritional composition is similar to that of other grains so it tends to get lumped into the grain family. Quinoa is a great gluten-free option for those who have a true allergy or intolerance to wheat protein, which many people do (but don’t get me started on the fad that ‘gluten-free’ has become). Quinoa is nutritious, as many of the labelled superfoods are. But there are hundreds of other foods NOT awarded the title of superfood that are equally, if not more nutritious. I like quinoa, but it is not always a staple in my kitchen cupboard. I have some at the moment as I am trialling some quinoa recipes for my book. Part of this inclusion relates to my fear that as a dietitian my integrity will be questioned if I don’t include quinoa or some sort of other ancient grain somewhere in the book. Saying this, my quinoa recipes are awesome (thanks to Justin Moran from Just In Time PT for his quinoa soup contribution, delicious)! Don’t worry, I have totally succumbed to peer pressure and included kale in a couple of recipes too. I was actually hoping that quinoa might prove me wrong and live up to the hype, but sadly no. Quinoa and oats contain similar kilojoule and protein content per 100g, less fat in quinoa, less carbohydrate in oats and just over four times more fibre in oats. Sometimes people are concerned about the fat content of oats, however they are still relatively low in fat, based on serving size, so don’t be mistaken that oats are fattening (we need some good fat). I must give credit where it is due, and hail quinoa for it’s vitamin and mineral content (which is similar to oats in terms of iron, calcium and magnesium content), amino acid profile and taste, I do love the taste. Quinoa has great value for vegetarians and athletes due to the higher protein and nutrient content compared to standard rice, pasta and noodles – you don’t see stir-fry and oats served too often. Quinoa has a wide range of amino acids, and although often promoted as a complete protein, the total amount of protein in an average serve is quite small, around 6g per serve (50g dry). Particularly when we consider athletes, who need adequate essential amino acids from ~20-25g protein for the immediate post-exercise recovery period. Quinoa doesn’t quite cut it for recovery protein on it’s own, but combined with a high biological value protein source such as meat, fish, eggs or dairy it is a highly nutritious choice, and a great option as part of meals over a training day. Oats are not considered a complete protein, but the amino acid profile comes pretty close. It lacks lysine, an amino acid which is low in many grains, but which quinoa does contain in small amounts. 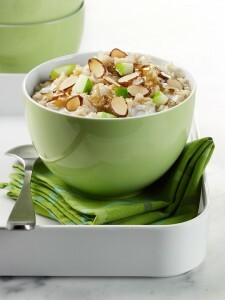 As per quinoa, oats should be served with an additional high quality protein source if consumed as a recovery option. An additional tick for oats relates to the beta-glucan they contain, which may be beneficial for those trying to reduce blood cholesterol levels. Porridge or muesli for breakfast looks all that more attractive. If you are trying to lose weight, both oats and quinoa are low-glycemic index, great for sustained energy levels and improved satiety – a small amount goes a long way. Have you tried quinoa porrdige, not too bad! Quinoa is gluten-free and a great option for those who have a gluten allergy, oats are not quite gluten-free but come pretty close, and are tolerated well by most people with an intolerance to wheat and wheat products. So without labelling, both quinoa and oats can be considered ‘super’ ‘foods’ (note the differentiation from ‘superfoods’). If I had to choose one over the other……I think the real clincher would be the price…….homebrand oats work out at around $1.60/kg, compared to over $20/kg for quinoa. You pay 12 times as much for quinoa…..is it 12 times as nutritious?? Think about your overall dietary patterns, what YOU need and how you can enjoy both/either oats and quinoa to bring you health, energy, and performance benefits. This opinion piece was written by Advanced Sports Dietitian Lisa Middleton who can be contacted through her website www.lisamiddleton.com.au . All opinions expressed in this piece is that of the authors.